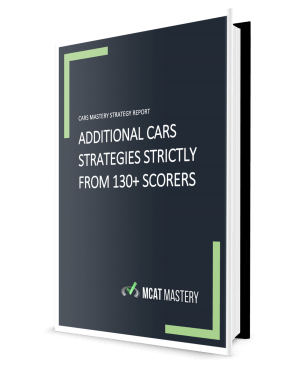 In this article, we've done a full step-by-step demonstration for you of how a 130+ CARS scorer would go through all the paragraphs of an AAMC CARS passage, analyze all the questions and all the answer choices, and consistently identify the right answer choice. It's our hope that with this and the many other CARS passage dissections we have for you, you are able to get a better understanding of how all the strategies we talk about, are applied in different scenarios. Before going through this, it would be helpful if you're already familiar with a lot of the top scorer CARS strategies we mention throughout our blog and emails. But if not, you'll still find this valuable (you might just miss a few things here and there). In order to follow along you’ll need to have access to the AAMC CARS Question Packs (Volumes 1 and 2). Here we’ll be covering Passage 15 from Question Pack 1. Before moving on, make sure you have it open. Keep in mind that our main objective for doing this is to show you the thought process of a 130+ scorer as he or she is going through the passage and questions. We’ll try to make it flow but keep it succinct at the same time. We’ll start by going through each paragraph, identifying the key points and revealing certain identifiers that help us get to the key points, and eventually, to the overall argument of the entire passage. We recommend reading through the entire passage first and coming up with your own ideas, interpretations, and answers, before going through it with us. Tells us barely anything. Just emphasizing how complicated the relationship is. Usually with a statement like this, you can be certain that they’ll be clarifying what they’re talking about soon. What’s being said here is that the artists themselves don’t really see these conventions as “conventions” since they’re so engrossed in this world, this is just how things are. Overall we’ve gotten the idea that artists have been trained in a specific set of conventional skills and to anyone in a different social class, the paintings seemed completely strange. So the key point of this paragraph can be something like..
​Artist painting is not experienced the same way to anyone outside the artist’s social class. This is the topic of this paragraph. Keep it in mind. The key word here is “tried”. They’re leaving it open for a success or a failure which you’ll likely find out about in the rest of the paragraph. Now, we don’t have to understand exactly what he’s saying and exactly what his argument is. It can hurt your brain even trying to dissect that. Remember, long and wordy sentences like that are not necessary for you to understand completely. Just take the overarching premise and move on. So what’s the overarching premise? What’s the key point? The artist tried to extend professional tradition of painting but failed. ​It doesn’t matter why they failed or how they failed. Remember, you just want to grab the main idea, what the author's viewpoint is, and move on. That’s the only way you can get through this fast. We get one somewhat new piece of information here – a reason: the way painters were still trained. So the key point of this paragraph? First part of the sentence is telling us what we already know, and the last part brings about two new points which are “reduced area of experience” and “claims to be universal”. So looking back at all our key points from every paragraph, what’s the main idea of the entire passage? Well we can create the overall summary that artists were limited by their training because of conventional skills. It worked for a certain social class but didn’t for others. They tried to extend, but failed. Why did they fail? Same reason. Limited training. We learned that their skills weren’t universal. Artists limited by training and failed to extend professional tradition. OK so let’s move on to the questions! A) This answer choice is quite ambiguous and general. Usually wrong answers for main idea questions are specific, but this is an example of one that isn’t. The main idea is very specific so we can eliminate this. B) It’s not indicated anywhere that the training was done in order to appeal to ruling classes. C) This correlates with the main idea. Yes, their training has been continuously limiting the areas of experience. D) The beginning sounds right in that artists did attempt to abandon conventional methods, but we didn’t read anything about opposition from ruling classes. It’s all about how they were trained which was holding them back. First, this questions involves you quickly glancing over to the passage to find where the word ‘tradition’ is used. It’s tempting to use CTRL+F here but don’t get into that habit because that tool isn’t available on the real exam. Use opportunities like this to train your eyes. Second, before you even bother finding the words in the passage and trying to figure out the context so you can answer the question, why not first go through the answer choices to see if you can make some eliminations? A) We know the author never agreed with this idea. This might be true for the artists but not the author and remember, we always go with the author’s viewpoint. B) There is nothing false about this answer. It also represents the main idea. We saw it in the beginning and within the passage that artists are trained in a set of conventions and correspond to the ruling elite whom they’re serving. D) The concept of the unconscious was raised in the third paragraph which is more an example of tradition dismantling, so tradition can’t relate to ‘expansion’. 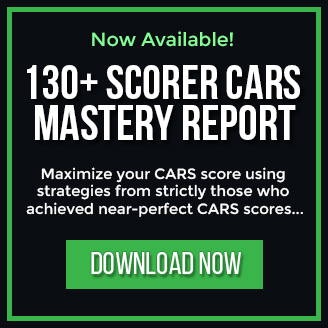 Want more 130+ Scorer CARS Passage Dissections? We have a lot more step-by-step walkthroughs included this ultimate CARS strategy manual. Along with more dissections, it also includes all of our best CARS strategies that have come directly from the proven results of strictly 130+ CARS scorers. A question starting with “A passage implies…” or some version of that, especially when it’s kept broad like this, is generally a main idea question. A) Boom. Hit the main idea; artists try extend tradition but their training which have taught them conventions limiting them. Clearly the author thinks that if one can go beyond conventions, that’s when art and artists succeed. The author doesn’t seem to like art that fails to go beyond conventions. B) Not mentioned by the author. Author never mentions that they’d prefer art to do this. Plus, it’s too narrow to be part of the main idea (in case you doubt the main idea you’ve come up with). This was mentioned once in the beginning but was never emphasized. C) Very ambiguous. Doesn’t specify the social manners. Plus, art always reflects social manners of a class, but the authors viewpoint is clearly that it’s just limited to one social class. D) Obviously out of question because religious themes are barely spoken about and/or compared. We don’t have a clear viewpoint on this. So this idea was introduced right in the beginning of the passage. Something to note here is that it says ‘most likely’ which is calling for you to choose the best answer, not necessarily the only answer. A) Question writers often do this – combining different pieces of the passage. One part of the passage talked about ‘narrowness and isolation’ (p.3) and the other talked about ‘ruling classes’ (p.1). These ideas aren’t connected if you reference to the areas where each topic is found. B) This is a tough one. At first read it sounds right. But this is where careful reading and answer analysis pays off. In this passage we’re shown a lot of instances of artists trying to extend into different experiences. Just the fact that artists made the effort, means that artists could not have felt that the experience of the ruling classes were the ONLY kinds of activity worth recording. The word ‘only’ is key to pick up on. It’s tricky because if you replace ‘experiences’ with ‘conventions’, now the statement makes sense. It’s important to have the main idea in mind at all times, plus look for key words like ‘only’ and ‘always’, and not go with the answer that ‘sounds right’. C) This idea was never mentioned. We can eliminate it right away. D) Here’s where it gets interesting; this was also never directly mentioned in the passage. An answer choice of this nature is extremely uncommon. The closest thing this answer choice is referring to is the point in the passage where it was mentioned that artists are serving the ruling class. It shows up in p.1 where it says “And these conventions corresponded… of the class the artist was serving…”. That’s what they’re referring to and expecting you to make the assumption that they were serving this class as their method of income. Again, it comes back to choosing the ‘most likely’ answer. The other answers aren’t any better, in fact they’re worse. That alone can be the reason you choose this answer. Keep in mind that more than most of the time, the answer choice will be more obviously linked to the passage than here. This idea was covered in Paragraph 2. First key thing to do would be to note that paragraph’s key point which was that artists tried to extend professional tradition but failed. Keep in mind that in a paragraph when you’re given in an example, it’s usually in support of the key idea of that paragraph. So since the question is referring to the discussion of an example, we can assume that this discussion is backing up the key point of the paragraph. A) This ties into the paragraph’s key point. Artists tried to expand and had a hard time with it which resulted in failure. B) The comparison between realistic subjects and abstract art was never mentioned. Eliminated. C) This is a question written to kind of throw you off. The passage does mention that the problems of expanding are with us today, but that wasn’t mentioned in the context of this example and in the same paragraph. This is a tempting answer choice because of that – it kind of ‘sounds’ right. But if you consider that the beginning of the second paragraph starts with “During the 19th century…”, that tells us everything we need to know. D) The relationship between artists and ruling classes is primarily covered in paragraph one and not the paragraph of this example. Another attempt at throwing us off. We need to keep reminding ourselves to stick to the example and that’s all. If it deviates a little from the example, the paragraph, or the key point of that paragraph, we can eliminate it. The fact that most CARS passages are like this is not necessarily a bad thing – it’s more like a challenge. That’s how 130+ scorers see it at least, and that’s what we’d advise you to do as well. Like any challenge, it’s hard. But, like any challenge, it’s solvable. It’s like when you first start doing hard crossword or Sudoku puzzles. It can get frustrating. But once you keep doing it and practicing, you start getting better, you start completing them faster, and it starts getting fun because you now ‘see through’ the challenge-creator’s attempts at tripping you up! 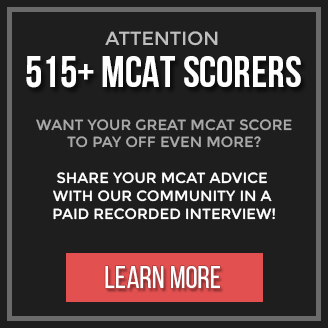 So you can start applying them right away, so you can stop wasting time trying to figure it all out, and so you can start seeing immediate, consistent PROGRESS in your MCAT score to get you over that 500 or 510 mark as soon as possible! It’s literally a no-brainer to do this. So unless you want to keep shooting in the dark, hoping you’ll figure it out one day, hoping the right methods will come to you in a spark of magical insight, get the proven tricks and strategies now before it’s too late and your MCAT date is closer than ever before. Lastly remember, on exam day those who will get the highest scores aren't those who are the smartest students in the room, it's those who were the most strategic in their MCAT prep. How strategic have you been in your MCAT prep?